Bled looks like the opening plate of many a wonderful fairytale, with its beautiful lake with little wooded island in the centre, castle, chapel and all backed by the Julian Alps reflected in the calm, emerald waters. Its appeals means it can be pretty busy in peak season. It also means there's no shortage of choice when it comes to choosing the best places to stay in Bled. From five star hotels, to pensions, and Garni hotels (B&Bs), to hostels, villas and campgrounds. Bled has long been a popular place to visit and is still Slovenia's most popular resort town. The landscape is the big draw, but these days it's not just to admire, it's also to explore. Bled is an active holiday destination as well as a romantic one. There's biking, sailing, walking, and even climbing, rafting and canyoning opportunities. Bled's most romantic asset is probably the lake itself. There's a gentle 6km long walk along the shore, and when you're done looking you'll be pleased to discover that thermal springs heat the lake to a very comfortable 26 degrees! Lake Bled has always been a place for lovers. Lake Bled is good for an afternoon's calm rowing or a spot of diving, after that you may like to head over to Vintgar Gorge. This is a spectacular spot for less adventurous types too, as the 4km walk offers some pretty dramatic scenery. The wooden walkway crosses above the tumultuous Radovna River several times. The gorge is lined with waterfalls of different sizes, as well as rapids and potholes. Vintgar Gorge is only 4.5kms walk from Bled and is the southwestern corner of Triglav National Park, Slovenia's only national park. If you're here to visit the Triglav National Park, some of the best places to stay in Bled are close to transport links. Within the park there is plenty for active visitors to do. Explore the caves, trek in to see some impressive waterfalls, or spend two nights scaling Mount Triglav. There are plenty of places to hire bikes in Bled and you can also hire a horse - with or without a guide. If you're here to take in the views you'll also want to visit the castle, the island and the church. Perched 100 metres above the lake, Bled castle is more residence than fortress and has been added to over time. Bled has a little of the Baroque to it, a little of the Gothic and its first tower, built around 1004, is Romanesque. Seat of the Tyrolian bishops for 800 years it was later a holiday home for the Yugoslav Royal Family. For visitors there is also a little museum about the lake and its history and a chapel with memorable frescoes. Bled island is tiny, but worth the charming gondola trip over so you can climb the long staircase to the little church and tiny museum. The larger Church of the Assumption is worth visiting for its art. There are some lovely frescos, a beautiful Romanesque chapel and a 'wishing bell' - which all add to the romance. Given its popularity, be sure to book ahead to avoid disappointment... The best places to stay in Bled get quickly filled up, especially in the busy summer months. If you like the idea of being right on the shores of Lake Bled, one of the best places to stay in Bled is the Grand Hotel Toplice. 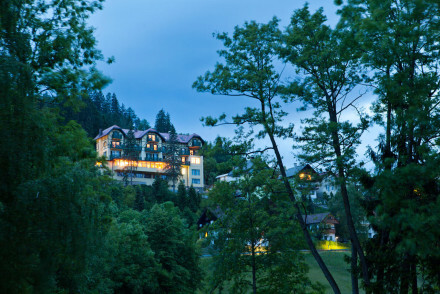 This is Bled's oldest hotel, built here so that visitors could use the private beach or take the thermal waters in the indoor pool fed by the town's thermal springs. A much smaller, more personal option, but also located right on the edge of the lake, is the Villa Preseren. Situated just below the castle and has a wonderful terrace for admiring the spectacular view. 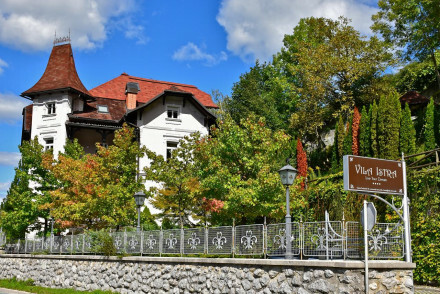 The wonderfully located Hotel Villa Bled offers smart and spacious rooms as well as two banquet halls serving up gourmet cuisine! Enjoy a good book in the lovely gardens or head out on a boat to enjoy the lake. 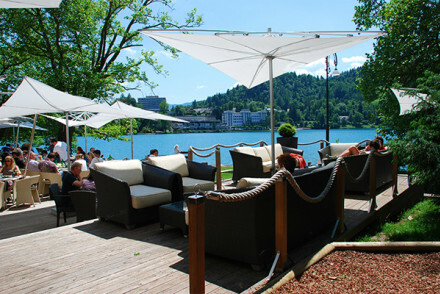 Bled is never exactly balmy, with the hottest months (July and August) experiencing average temperatures of just 10°C. However, this is also when there's the highest chance of rainfall - so make sure you remember a jacket just in case! The winters are bitterly cold, with average daily temperatures of -6°C in December and February, so you're best avoiding visiting at this time. International visitors can fly into Ljubljana Joe Pu?nik Airport, located 34k southeast, before taking the bus on to Bled. easyJet fly to Ljubljana from Gatwick and Stansted, whilst Wizz Air go from Luton. Browse through our list of all the best places to stay in Bled. Widen the net to search through our recommendations in Ljubljana or the entirety of Slovenia. A charming little hotel positioned on the shore of Lake Bled. A fantastically romantic setting, comfortable boutique rooms, an excellent restaurant and terrace facing the water's edge. A great choice for a romantic weekend in Bled. Lakeside - Fabulously positioned on the edge of Lake Bled. A statuesque hotel on the banks of romantic Lake Bled. A grand traditional facade, spacious rooms in elegant style, and luscious gardens leading to the lake. Two banquet halls serve gourmet cuisine and excellent Slovenian wine. The villa was once a holiday destination for President Tito! 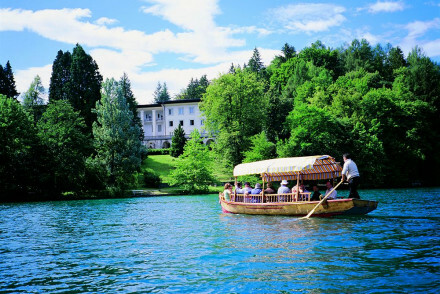 Sailing - You can take a boat around the lake and to Bled Island. Sights nearby - Church of Sv Marika Bozja, Lake Bled, and Bled Castle. 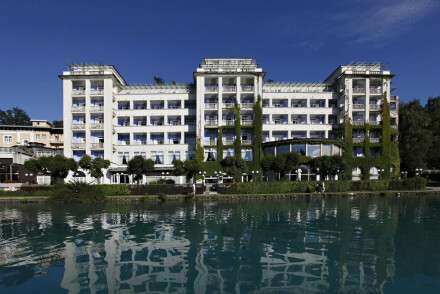 A recently renovated 4-star hotel in the hills above the stunning Lake Bled just a short walk into the town centre. Rooms are simple with traditional furnishings, romantic views and the best have balconies. Featuring an indoor pool, a top quality restaurant and a well-stocked wine cellar. Charming. A wonderful lakeside villa with lush gardens leading down to the shore. Interiors are stylish and unfussy. Chic rooms have stunning views, some with balconies, and the more sumptuous have statement wallpaper and antique furniture. Perfectly positioned just a short distance from the town centre. A venerable old institution on the shores of Lake Bled, perfect for experiencing the town's thermal springs and life lived at a less frenetic pace.